Record your own voice greeting! Ideal for holiday greetings, birthday wishes, wedding invitations, baby showers, or just keeping in touch with loved ones! 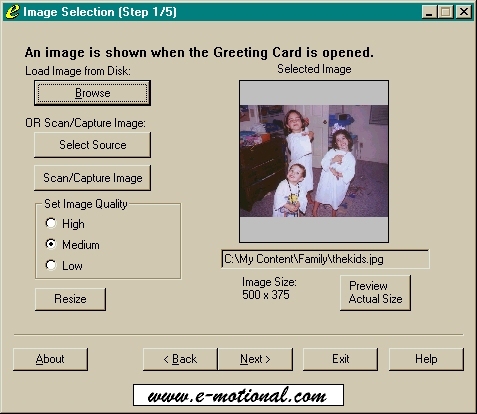 The e-motional Greeting Card Creator offers benefits over Internet greeting cards. are personalized with your own photos, text, recorded voice and sound effects. Creating the card is easy: an intuitive setup program guides you through 5 simple steps. 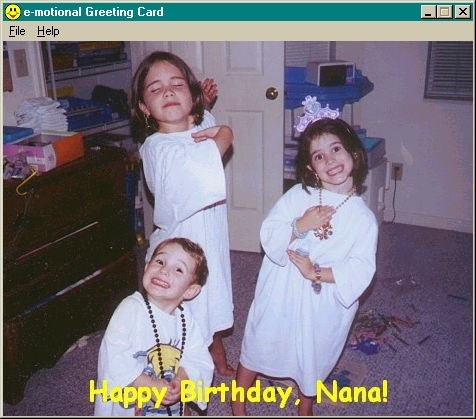 The Greeting Card Creator will import your favorite photographs directly from a digital camera or scanner, or load existing image files. You can record your own voice, or add a .WAV-file sound effect! Add a text caption, then preview your card and e-mail it directly to your family and friends! 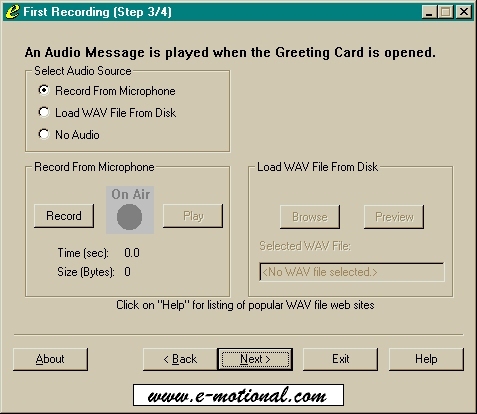 The step-by-step instructions are so easy to use that even a computer novice can create an electronic greeting card within minutes. Once you have created the card, you may choose to email the card immediately, directly from within the creator program, or save it to a file to email or view later. The greeting card is a self-extracting executable file (.exe), so the recipient of the card does not require any other programs in order to open it. In order to email a card directly from within the creator program, you must be running a MAPI-compliant email program. If your email program is not MAPI compliant, you can still email the card: just save it to a file, then add it to your email message as a file attachment. The recipient can simply click on the attachment to open the card. PLEASE NOTE: some email programs do not accept executable (.exe) files as attachments, in order to protect from potential viruses. So, if the recipient clicks on the program and it doesn't open, just rename the file to a text (.txt) file extension, and then click on it to open. A great way to share your photos and memories! Visit WavSource.com and download WAV Files -- FREE! 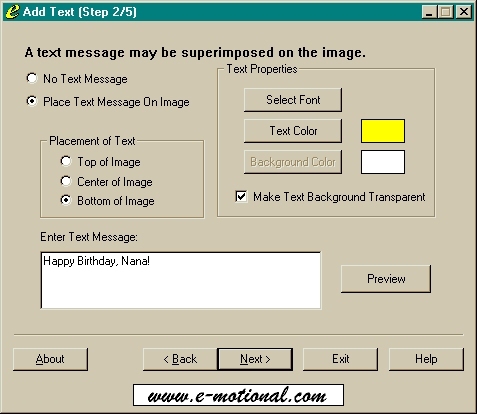 Below are images that show how easy the e-motional Greeting Card Creator is to use. Click on an image to see it full-sized.